Rupert played Benedick (oh my heart!) in this production of Much Ado about Nothing at the Shakespeare Festival Neuss in Germany, while Rupert was filming the third season of Merlin. The production is featured here on the Festival website, and here on the Internet Shakespeare Editions site. I have also found a Facebook page for the production that includes some photos, which I’ll upload to a separate gallery page. Interestingly, Helen Bradbury was Rupert’s Beatrice – and she also played Grace Tranfield with him in The Philanderer. Rob Heaps was Claudio – and he played Bobby with Rupert in While the Sun Shines. I have to say this sounds like perfect casting! I also found a marvellous promotional video which includes him singing, waltzing with his Beatrice, and generally being his adorable self! However, it now seems to have vanished. Rupert played the character Kurt (and was part of the ensemble) for this production of a new play by Michael Frayn. The production is still featured here on the National Theatre website. This delightful photo was taken in rehearsals by Conrad Blakemore. All rights remain with the photographer and the National Theatre. Rupert played the American Lieutenant (and was part of the ensemble) for this new play by Howard Brenton. 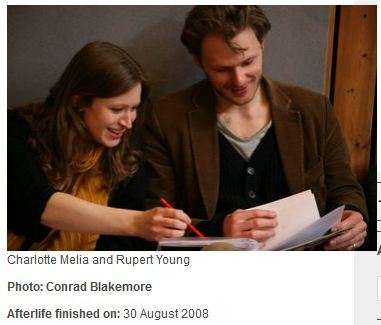 Information on the production can be found here on the National Theatre website, and Rupert has his own page. Rupert played the character Brian Curtis in this play by Terrence Rattigan, for the English Touring Theatre (ETT) company. You can find out more about this production here on the ETT site. This photo is used with respect but without permission. All rights remain with photographer Nobby Clark (this fellow, I assume) and the English Touring Theatre company. Rupert played the character Prince Peter in this Christmas pantomime. Rupert played a Sailor in this production of the Glibert & Sullivan musical. Rupert played the character Guiderius in this rarely performed Shakespeare play. Rupert played the character Valentine, one of the Duke Orsino’s men, in this Shakespeare play. There’s an interesting article about the challenges of running this open-air venue here: whatsonstage.com. Rupert played Luciana in an all-male production of The Comedy of Errors at the Shakespeare Festival Neuss in Germany. I assume it was this production in July 2004, as we’ve heard separately that he was in a production of this play for Wild Thyme Productions in 2004. According to his CV, the director was Stephen Jameson. The all-male cast wouldn’t have helped with all the mistaken identities! Seriously, though, I see they also did an all-female Hamlet, which must have been extraordinary. This is one of the plays listed on Rupert’s CV from when he was studying with LAMDA. It is a musical, with book and lyrics by John Dempsey and music by Dana P Rowe, that premiered at the Donmar Warehouse, London in 1997 (Wikipedia). Rupert played the character Cal Chandler, with directors Anne Durham and Stephen Jameson. I’m not entirely sure of the year, but I’m guessing the first half of 2004 (i.e. at the end of the 2003-04 academic year).